iFixit has become a popular source of information for readers wanting to know how to repair electronics. Their website is also popular for performing teardown of handsets right to the very bone, and after they got their hands on a LG G5, you guys obviously know what was going to happen next. Question is, what is the score that the teardown crew gave to LG G5 in terms of repair and internal build quality; looks like we will find out soon enough. 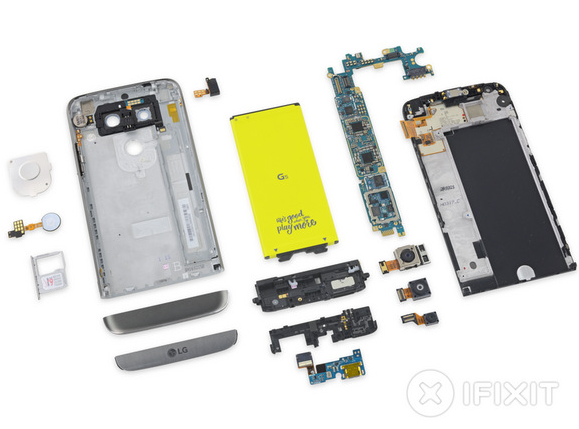 If you want to do a teardown of LG G5 yourself, then chances are that you will not have to put in much effort since iFixit gave an 8 out of 10 score for repairability, which is quite impressive, considering how other handsets and tablets have an abounding amount of adhesive to keep all the components from slipping out and normally receive a very poor score. 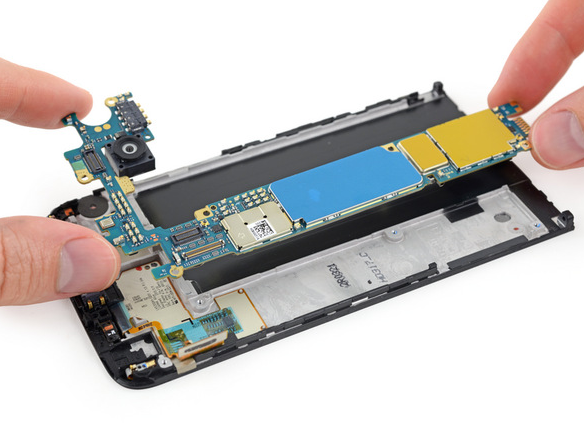 According to the teardown experts, the smartphone was extremely simple to disassemble, which you do not see from devices sporting a unibody design. 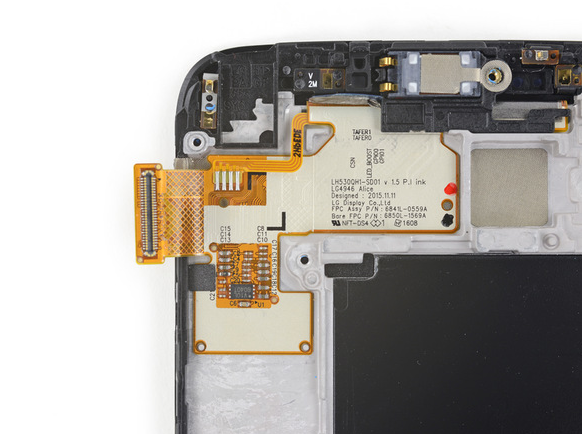 Moreover, Korean smartphone OEMs have been praised for making their handsets easily repairable. One the most interesting features of the device has to be its replaceable battery. Despite sporting a unibody design, LG G5 does come with a removable battery that has to be pulled out of the housing. While this is very unorthodox, it does deliver both aesthetics and flexibility, which are attributes that you do not see play well at all in modern day smartphones. Coming to the hardware specifications of LG G5, underneath the hood, you have a Snapdragon 820 SoC, which was expected from the handset. What we did not expect was the 5.3-inch IPS LCD display with a resolution of 1440p. Seeing as how the company’s V10 rocked an impressive 5.7-inch display, we were expecting a 5.5-inch as a bare minimum. There is also 4GB of LPDDR4 RAM, and 32GB of internal storage. However, just like last time, LG has decided to provide the perks of both design and convenience as it allows you to effortlessly remove the 2,800mAh battery and add a MicroSD card with a maximum capacity limit of 2TB. Keep in mind that storage manufacturers have not come even close to that capacity range, with the maximum storage you will find from a MicroSDXC card is the Microdia 512GB. While 2,800mAh might be a bit on the low side for a flagship smartphone, the updated UI and Android Marshmallow 6.0 OS running on the smartphone will allow you to get the most out of your device in terms of battery. Coming to the rear camera sensor, LG G5 retains the same megapixel count that was present on the company’s G4 and V10, but what is disappointing is that the fixed aperture remains at F/1.8. While images will still come out sharp and detailed, LG should have incorporated a wider aperture lens inside its flagship offering. However, with a wide angle lens of 135 degrees, you will be able to capture more content appearing on the phone’s viewfinder, which is a terrific perk to have. 4K video is present, which was expected, and a surprise addition over here is that the device is incorporated with a Type-C USB port. Do you guys think that LG G5 should be considered as a worthy contender for a phone that oozes both flexibility and looks? Tell us your thoughts right away.